4. Seattle Seahawks: Pete Carroll has one of the more interesting competitions to focus on in the NFL. Management went out in the offseason and signed free agent Matt Flynn to a nice contract after he showed unique abilities in Green Bay. The question becomes, is Flynn really a franchise guy, or was he only the product of an efficient system under Mike McCarthy? The only way to find out is to put him to the test this preseason. The other player in the mix is rookie Russell Wilson, who on paper doesn’t look like a viable option (Tarvaris Jackson seems to have faded out of the race for the starting spot). But the more and more you watch him you see what kind of athlete he really is, and he really makes you want to give him the reigns. My prognosis, start Flynn. I think his abilities are sufficient, and if he really does fail to win games, then go to Wilson. The Seahawks defense should win them games anyway. 3. Arizona Cardinals: You have to give up on Kevin Kolb at this point right? He has never become the quarterback Andy Reid said he would be and even players in the Cardinals locker room seem to be in report of John Skelton. With the great Larry Fitzgerald still running routes in Phoenix, the coaching staff must put the quarterback out there who can best get him the ball. ESPN’s Adam Schefter has reported that Skelton is looking like the probable starter for Week one and I’d have to agree with that report. Skelton over Kolb at this point. 2. Tennessee Titans: This is a no-brainer for me. 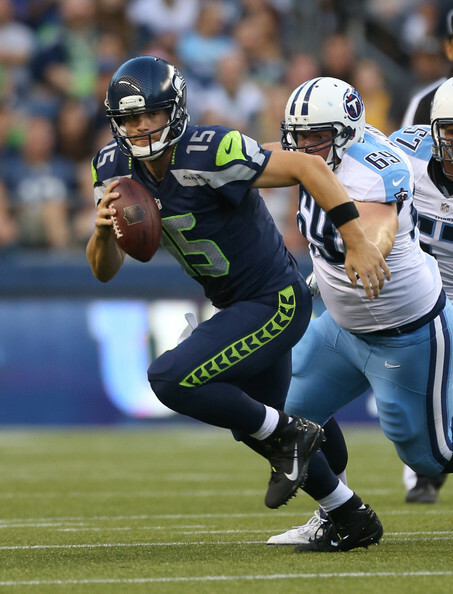 You have to start Jake Locker in Nashville this season. When you spend a top-10 pick on a guy that you hope will become your franchise quarterback, you have to let him shine. Given that point, Locker has actually played well when he’s had the chance. Matt Hasselbeck has experience and he’s a proven winner, but with his age on the rise, I believe he would play a better role as Locker’s tutor. The Titans may have the best backup in the league now, in Hasselbeck. 1. Miami Dolphins: There wasn’t a two-man competition in Miami at the start of training camp, but instead a three-man one. But now that David Garrard is out with a knee injury, I do not think he will start the season on time. There is a good chance Garrard will be the guy at some point during the 2012-13 campaign because he is the most proven, but given what Matt Moore has done in the past as a back-up, I like what he brings Miami at this point in time. Ryan Tannehill played well in Week one against Tampa Bay, but I still think he is a year away from being a starter in the NFL. Based on Moore’s play last season, he deserves the chance to start once again. This entry was posted in NFL and tagged Andy Reid, Arizona Cardinals, David Garrard, Green Bay Packers, Jake Locker, Jeremy Powers, John Skelton, Kevin Kolb, Larry Fitzgerald, Matt Flynn, Matt Hasselbeck, Matt Moore, Miami Dolphins, Mike McCarthy, New England Patriots, New Orlean's Saints, New York Giants, NFL, Pete Carroll, Russell Wilson, Ryan Tannehill, Seattle Seahawks, Tarvaris Jackson, Tennessee Titans. Bookmark the permalink.